Buried at Blighty Valley Cemetery Authuille Wood. 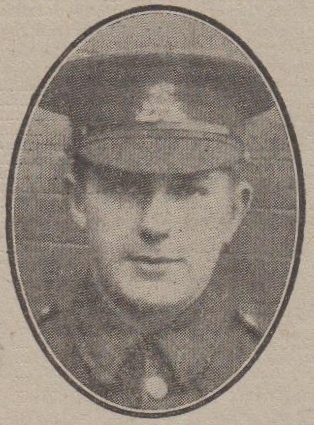 Private Albert Pearson of the Lancashire Fusiliers, who, as reported in our last week's issue, was killed instantaneously by shrapnel while in action in France on September 13th, was the eldest son of P.C. Pearson and Mrs. Pearson, of Fern Terrace, Haslingden, the sad news being forwarded to Private Pearson's wife on the Sunday morning, from his officer and from the chaplain who conducted the funeral. Private Pearson was 22 years of age, and joined the army in April, 1911, and was nearly two years in India and Arabia. After the present war broke out he had the distinction of being one who took part in the Lancashire landing at the Dardanelles. He was wounded in August, 1915, and was invalided to England, subsequently returning to active service. While on short leave he was married to Miss Alice Salkeld, of Baxenden. He went out again to the Eastern front in October 1915, but about ten weeks ago news was received that he had landed in France. He has two other brothers serving in the army, and his father served in the South African War. In loving memory of Private Albert Pearson (Lancashire Fusiliers) killed in action September 13th 1916; also his brother, Percy, died of wounds, August 1917. Closer when we meet again." Ever remembered by Edith; also Mrs. Salkeld and family, Baxenden. That lies behind the smile. The face we love so dear." Ever remembered by his Wife, Mother, Sister and Brothers in Law, 13 Bridge Houses, Baxenden. Of the one we loved so well." From Mother, Father, Sisters and Brothers. Though God claimed them one and two years ago. For the loved ones gone before." From Mother and Father, and Brothers and Sisters, 4 Rock Street, Haslingden; also from the Brother Harry, still away. Also remembered by their Godmother, Mrs. Lord, Springfield, Bradford.